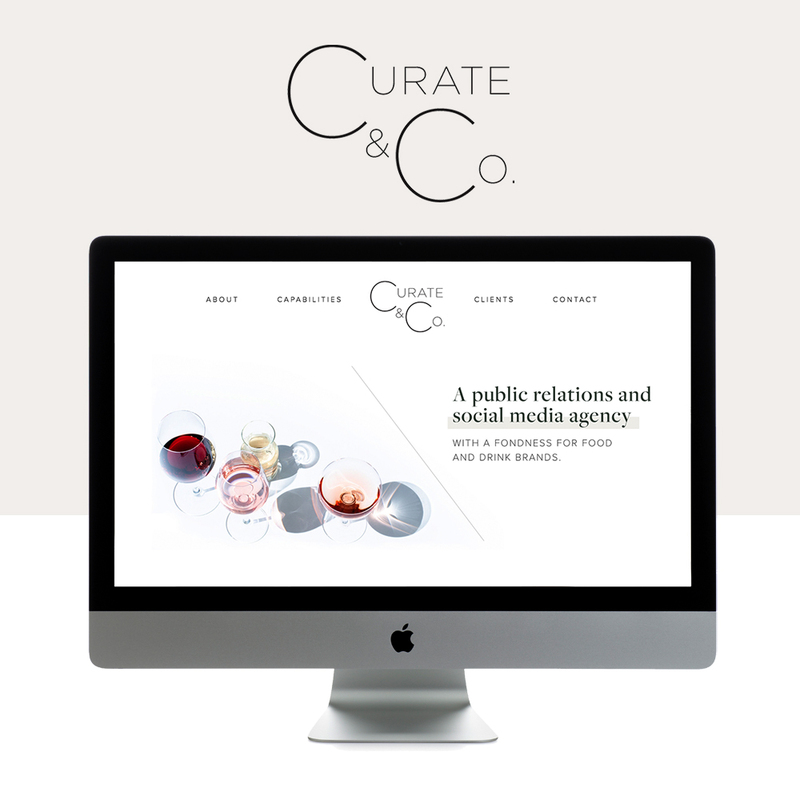 Curate & Co is a PR & with a focus on food and drink brands. 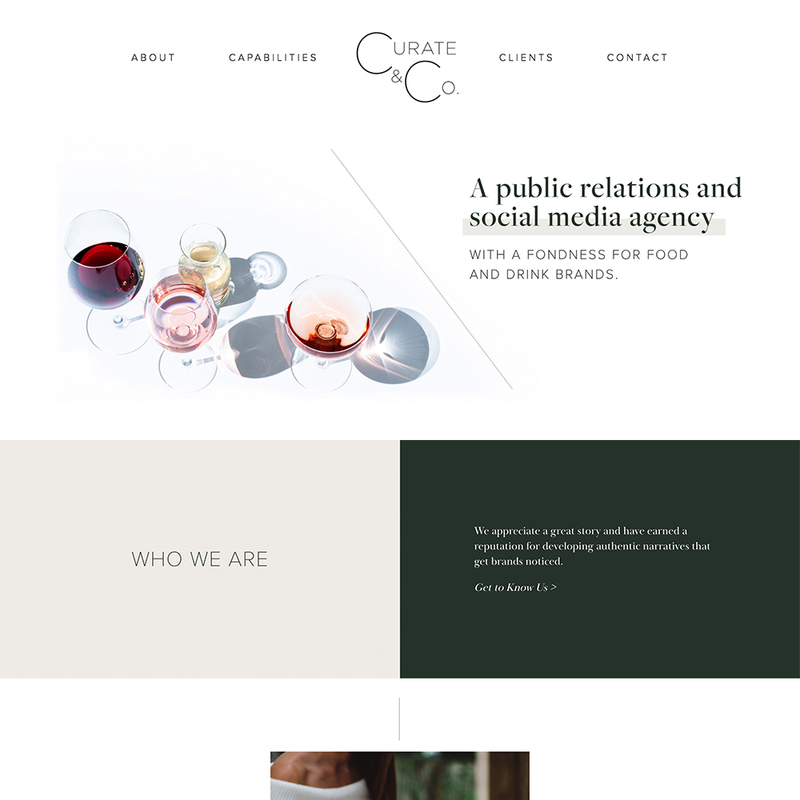 We designed a Custom website for the brand that captures their elegant, modern aesthetic and at the same time incorporates their fun and sincere style. This was a great design challenge that explored different design directions. We played with lines, colour blocks and mixed typefaces to create this modern yet classic look! Amanda: I fell in love with the food and drink industry while working at Ste. Michelle Wine Estates. While there, I worked on over 10 different wine and spirit brands so I was quickly immersed in the industry. GO LIVE: DID YOUR EDUCATION HELP PREPARE YOU FOR THE INDUSTRY OR FOR STARTING YOUR OWN BUSINESS? OR ARE YOU SELF-TAUGHT? Amanda: Most of what I do on a day-to-day business was learned. I went to business school, which helped me navigate the entrepreneurial side of the business (accounting, contracts, etc). Media relations, content creation, and producing event experiences are all things that a college classroom can’t “teach” – I think you have to experience it first hand to understand how to make it successful. GO LIVE: WHAT’S THE HARDEST LESSON YOU’VE LEARNED IN YOUR BUSINESS? Amanda: To trust my gut! The mistakes that I have made as a CEO have always been when I convinced myself that my gut was wrong. Amanda: This isn’t glamorous! My advice is to invest in an accountant, consult a lawyer, and make sure you have a really good support system. Owning your own business can give you the biggest highs and the lowest lows-sometimes in the same hour. GO LIVE: WHAT WAS THE MOMENT YOU HAD WHEN YOU SAID, “I SHOULD DO THIS” OR WHAT MADE YOU TAKE THE JUMP INTO WORKING FOR YOURSELF? Amanda: I’ve always had a desire to start my own agency, but for years I thought that I needed to wait until the timing was “perfect.” A couple months before I started Curate & Co., a mentor told me to take the leap! It turned out, that was the final push I needed. After working in the food and drink industry, I also had a desire to create programs that would appeal to a younger demographic. It’s not news that the wine industry can tend to market to an older demographic, but millennials have huge purchasing power and storytelling + experiences are the best way to create brand advocates. GO LIVE: WHAT THINGS HAVE YOU GAINED / DO YOU HOPE TO GAIN FROM FOLLOWING THIS DREAM? Amanda: Owning my own business gave me the freedom to explore my creativity and work with the clients and people that I want to work with. We love our clients - that’s why on our website we chose the phrase, “Meet the Fam” to showcase our clients. We care about the people we work with and the products they make! GO LIVE: WHY DID YOU ULTIMATELY DECIDE TO WORK WITH US FOR YOUR RESTYLE OR CUSTOM DESIGN? Amanda: Go Live HQ’s creativity and quick “go live” process were the top two factors that convinced us. FEELING INSPIRED BY THIS REBRAND? The Addice is Live on Showit!